Our colleagues in Cologne have put forward an interesting observation. They argue that most of the current ABMs in archaeology ignore the cultural dimension of human systems and instead treat agents behaviour in a mechanistic way. This has been a common criticism of economic models with their strong assumptions of rationality and perfect knowledge of the agents their model. However, I believe (tell me if I’m wrong), the lack of cultural complexity is raised for the first time in the context of humanities research. Agent-based modeling can be used in a multitude of ways by researchers and teams with different scientific backgrounds all around the globe. With this workshop we intend to provide an opportunity to discuss the role of culture in agent-based modeling. Therefore we would like to invite to join the workshop the researchers whose work is based on the assumption that human beliefs and behavior are not caused solely by physical conditions and individual experiences but also by transmitted knowledge shaped in historical and social processes. We want culture to be understood in a broad sense, so that we can discuss a variety of concepts of culture and its current or potential use in agent-based modeling. In their new paper Carolin Vegvari and Robert A. Foley (both at University of Cambridge) look at necessary ingredients for the rise of cultural complexity and innovation in their recent paper in PloS One. The question of cultural complexity is an anthropological mine field. To start with, the definition of ‘cultural complexity’ is controversial and difficult to quantify even if we concentrate solely on material culture. Should we count the number of tools people use? But that would be unfair towards more mobile societies who, understandably, don’t like carrying tons of gear. So maybe we should look at how complex the tools themselves are? After all, a smartphone contains more elements, combined in a very intricate way and performs more functions than, say, a hammer. It doesn’t work well in a nail-and-wall situation though. In fact, the differences in the amount and complexity of material culture among contemporary hunter-gatherers is: “one of the most dramatic dimensions of variation among foragers (…). Some foragers manage to survive quite well with a limited set of simple tools, whereas others, such as the Inuit or sedentary foragers, need a variety of often complex tools.” (Kelly 2013, 135). The rise of cultural complexity and especially the factors that contribute to it and the conditions that need to be met are therefore a big unknown in anthropology and archaeology alike. Similarly to all scientists we like big unknowns so a number of models have been developed to investigate various recipes for cultural complexity quite often involving radically different ingredients. Since early 2000s (I suspect Shennan 2001 was the seed for this trend) one of the favourite ingredients in the cultural complexity mix was the demography and the population size in particular. In very simple terms, the hypothesis goes that only large groups, which can sustain a pool of experts from whom one can learn a given skill, will exhibit higher cultural complexity. And this was actually applied to archaeological case studies, for example by Lycett and Norton (2010). 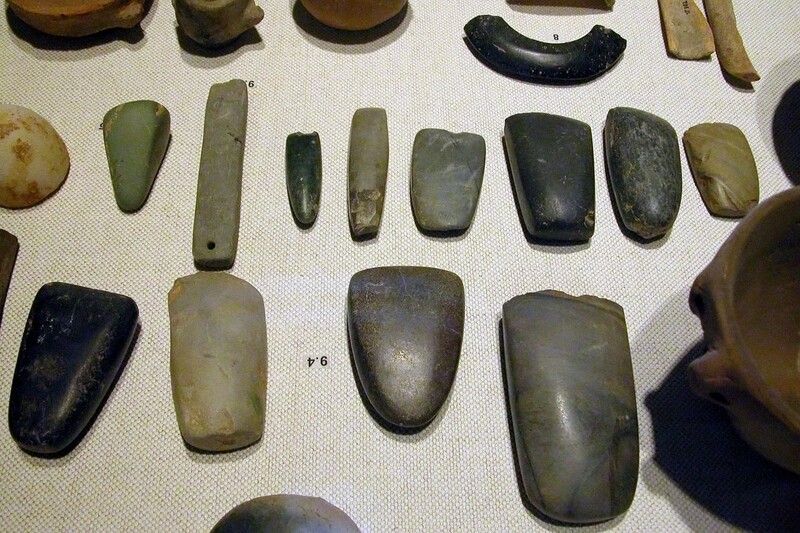 They argued that the notorious Movius Line slashing through the Lower Palaeolithic world is a reflection of lower population density in the south-east, central and north Asia causing the groups to drop the fancy Acheulean handaxes and to revert to the simpler Oldowan core-and-flake technology. Vegvari and Foley’s paper is a new stab at the issue. Their simple yet elegant Agent-based model consists of a grid world on which agent groups forage on depletable resource according to their skill level represented as a list of generic cultural traits. These traits can be improved to achieve higher efficiency in extracting the resources and new traits can be invented. Vegvari and Foley tested a number of scenarios in which they varied group size, selection pressure (really interestingly constructed as a factor lowering the efficiency of resource extraction from the environment), different costs of learning and the ability to interact with the neighbouring groups. The results of the simulation are really interesting. Vegvari and Foley identified the good old natural selection and its friend population pressure as the main drivers behind the increase in cultural complexity. Although, they work hand in hand with the demographic factors, the population size is a bit of a covariant. Lower population size means less competition over the resource, i.e. lower population pressure. It will, therefore, correlate with the cultural complexity but mostly because it is linked to the selection pressure. Interestingly, the learning cost came as another important stimulant for groups under high selection pressure and those who could interact with their neighbours as it increase the population pressure even further. Finally, Vegvari and Foley recognised a familiar pattern of the sequential phases of logistic growth. 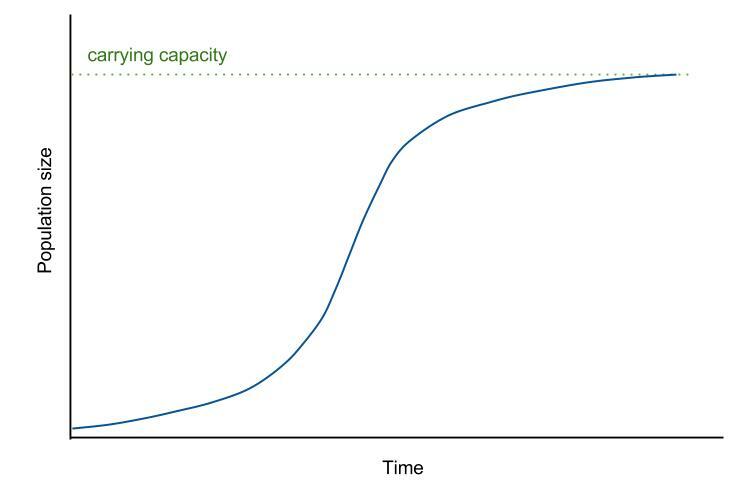 The logistic curve of population growth. It starts with the population climbing towards their relative carrying capacity (= the maximum of resource they can extract from a given environment), when they reach the plateau they undergo a strong selection pressure, which leads to innovation. A new cultural trait allows them to bump up the carrying capacity ceiling and so the population explodes into the logistic growth and the cycle repeats. Vegvari and Foley created a simple yet very robust model which tackles all of the usual suspects – demographic factors, natural selection and the cost of cultural transmission. It shows that the internal fluctuations of a population arising from simple social processes can induce complex population dynamics without any need for external factors such as environmental fluctuations. And this is a fantastic opening for a long and fruitful discussion in our discipline. Kelly, Robert L. 2013. The Lifeways of Hunter-Gatherers. The Foraging Spectrum. 2nd editio. Cambridge: Cambridge University Press. Lycett, Stephen J., and Christopher J. Norton. 2010. “A Demographic Model for Palaeolithic Technological Evolution : The Case of East Asia and the Movius Line.” Quaternary International 211 (1-2): 55–65. doi:10.1016/j.quaint.2008.12.001. Shennan, Stephen. 2001. “Demography and Cultural Innovation: A Model and Its Implications for the Emergence of Modern Human Culture.” Cambridge Archaeological Journal 11 (1): 5–16. doi:10.1017/S0959774301000014. Vegvari, Carolin, and Robert A. Foley. 2014. “High Selection Pressure Promotes Increase in Cumulative Adaptive Culture.” PloS One 9 (1): e86406. doi:10.1371/journal.pone.0086406.